The developers behind the realXtend branch of the OpenSimulator virtual world platform announced the formation of the realXtend Association today. The association’s founding members are Adminotech, the Center for Internet Excellence, ENNE, Evocativi, Letwory Interactive, Ludocraft and Playsign. All are 3D development companies. Pirkola himself is managing director of Cyberlightning, a 3D development company based in Finland. The realXtend is separate from but supported by the realXtend Foundation, founded by Finnish entrepreneur Juha Hulkko and the City of Oulu in Finland. Companies looking to join must be willing to contribute to realXtend development, though that contribution could be as simple as reporting bugs and commenting on their experience with the software. Membership is free. Association members will have a say in the future development of the realXtend platform. The realXtend development process began in 2007 and was originally based on the OpenSimulator server code, and used the Second Life viewer. However, with the roll out of meshes, realXtend began moving away from mainline OpenSim, eventually developing its own viewer as well as well as moving away from the licenses of the previous projects. Second Life’s third party viewers are currently released under the GPL license. This means that the software is open source, and that companies that create new software based on this code and distribute it must also make it open source. This is one reason why there haven’t been any commercial viewers based on the Second Life code base. OpenSim is currently released under the BSD license, which allows companies to modify the OpenSim software and keep the modifications proprietary. The licensing has allowed companies to release proprietary versions of OpenSim, including IBM’s SameTime 3D product. However, the fact that the server and the viewer operate under two different license structures is causing some logistical challenges for the two sets of open source developers, forcing them, in effect, to work in isolation from one another. By creating its own viewer from scratch, the realXtend developers have freed themselves from the constraints of the GPL license. Instead, they have adopted the Apache 2 license for both the server and the viewer. Apache 2 is similar to the BSD license but goes into more specifics and detail than BSD, and includes provisions for patent rights. “Now, realXtend is Apache 2 licensed and aims to be the de-facto standard for the coming 3D Internet,” Pirkola said. However, realXtend has a long road ahead of it before it actually becomes a de-facto standard. Today, there are more than a hundred public OpenSim grids, and hundreds of others running in private mode. There are no public realXtend grids. In addition, the realXtend viewer, Naali, is substantially different from the Second Life viewers. As a result, realXtend’s end users can’t leverage their previous Second Life experience — or take advantage of the wealth of documentation, video tutorials, free training classes and other resources available from the Second Life and OpenSim communities. Another challenge that realXtend is facing is that its main differentiator from OpenSim — its mesh support — is about to go by the wayside. Last fall, Second Life rolled out experimental mesh support and OpenSim began supporting meshes the very next day. 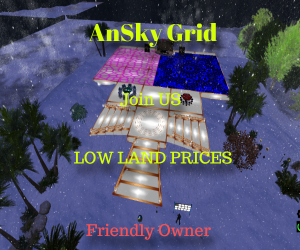 Today, cutting-edge OpenSim grids already have meshes, and visitors can see them by using Second Life’s experimental mesh viewer. OpenSim is likely to move mesh support into the recommended release of its software when Second Life adds it to the default viewer. However, according to Playsign’s Toni Alatalo, realXtend is about more than just meshes. The key differentiator between realXtend and other platforms is its modularity and extensibility. By comparison, in the Second Life-compatible viewers, the arrow keys always move the avatar. In many ways, realXtend is more like Unity 3D — the browser-based 3d game plugin — than like OpenSim, he said. In fact, the viewer has been tested as a browser plug in, and it works. “But it takes some work to make it behave well, and that is planned now,” he added. In addition, development is currently underway on WebNaali, which uses WebGL and doesn’t need a plugin at all. However, WebGL isn’t fully implemented yet by Web browsers, and not all realXtend features are available in WebNaali. “Work on this may continue soon, too,” he said. Finally, dozens of vendors — including ReactionGrid, PioneerX Estates, Dreamland Metaverse, SimHost and, most recently, Kitely — are working hard to make OpenSim easier to deploy for would-be sim and grid owners. There is also a fast-growing community of content creators and both online and in-world stores offering goods and services for OpenSim. By comparison, realXtend lags behind in usability and in its ecosystem. As a result, realXtend is currently used for behind-the-scenes infrastructure on top of which developers are building games or meeting platforms, and not as an alternative to Second Life. The best-known participants in the realXtend project are Intel and Nokia, who are collaborating on the Intel and Nokia Joint Innovation Center. “They are doing mobile 3D user interface research and are contributing a lot [to realXtend],” said Pirkola.